An aerial view of the Fromm fur and ginseng farm in Hamburg, Wisconsin. Date unknown. Photograph courtesy of the Marathon County Historical Society. Alwina and Frederick had four sons, Walter, Edward, John, and Henry. As teenagers, the Fromm brothers pursued interests in ginseng farming and raising foxes, a significant turn away from the more traditional farming their family had previously practiced. In 1909, the brothers used profits from growing ginseng to purchase a pair of “silver-blooded” foxes. Anticipating a shift in fashion toward silver furs, for the next two decades, the brothers worked tirelessly to breed foxes with the healthiest and brightest silver pelts possible. Their father Frederick often lamented that his sons were ruining the Hamburg family farm with their smelly foxes and unsightly ginseng arbors. But, he had changed his mind after the farm’s ginseng and foxes brought in a million dollars in a single season in 1928, he came around. The Fromms posing in front of the family home, late 1930s. Photograph courtesy of the Marathon County Historical Society. 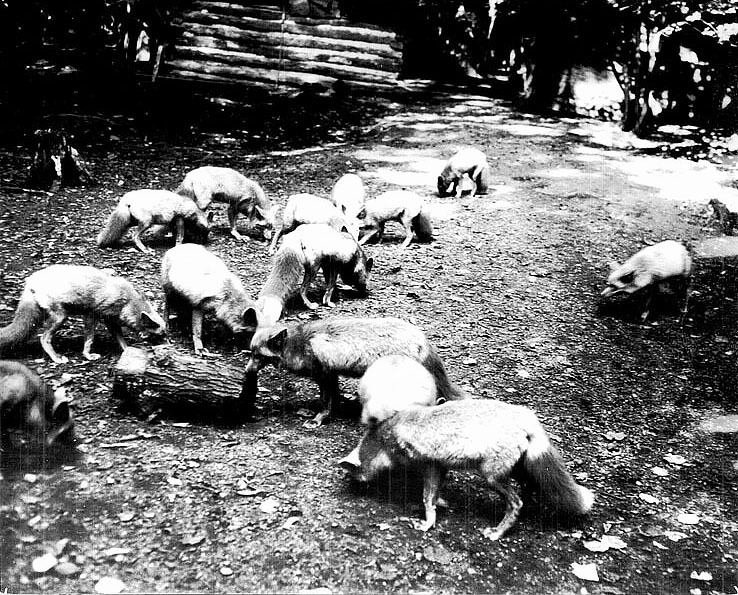 By the 1930s, the Fromm brothers had become world-renowned for the quality and color of their furs and had even been involved in the development of a vaccine to prevent distemper in foxes. In 1935, the brothers upended the fur industry by holding successful fur auctions at their Hamburg farm, instead of sending pelts to fashion centers like New York, London, and Paris. The four Fromm brothers, L-R: John, Henry, Edward, and Walter, 1937. This image was part of a series of photos featured in newspaper ads that ran across the United States introducing the Fromms to fur buyers. Image courtesy of the Marathon County Historical Society. In 1937, at the height of the Great Depression, the Fromm Brothers Company saw $10 million in business. In addition to the 500 acres dedicated to ginseng production, the brothers hired over 180 employees to deal with over 36,000 silver foxes, as well as an increasing herd of mink. In the early 1940s, they even opened their own clothing factories (including one in Merrill, Wisconsin) to make Fromm fur coats themselves. The company declined in the decades following WWII. Postwar fashion had come to prefer mink fur over fox, and although the Fromms cultivated an expansive mink herd beside their beloved foxes, renewed competition from other fur farmers meant that the family never regained the market share they had enjoyed in the mid-30s. Although the Fromms continued to produce furs well into the second half of the 20th Century, pressure from animal advocacy groups led to fur virtually disappearing from wardrobes, and by the 1970s fur was no longer farmed on the old Fromm homestead. Kathrene Pinkerton, Bright With Silver (New York: William-Sloane Associates, Inc., 1947), 8-9. The Fromm’s first foxes did not have full pure silver coats themselves. Although fur farmers didn’t yet understand the role genetics played in bringing out different traits like the color of fur, they had recognized that if a fox had been born to silver-furred parents, it could pass on silver fur to its own pups, even if the fox in question did not have full silver fur itself. This was often a more cost-effective route to building a herd of silver foxes compared with buying the more expensive pure silver-coated foxes to begin with. Pinkerton, Bright With Silver. Melvin N. Taylor, “Ten-Million-Dollar Fox Tale,” The Saturday Evening Post, February 13, 1937. Phil Nero and Sharon Thatcher, “Remnants of a Dynasty,” The Milwaukee Journal (February 3, 1991). Carol Dyhouse, “Skin Deep: The Fall of Fur,” History Today vol. 61, no. 11 (2011): 26-29.